As part of our ongoing commitment to assist community groups and to improve our local area we have recently completed our 2nd community project. Our Community Investment Fund is used to work with local groups on any small scale project that benefits the wider community. We don’t have a direct fund which groups can apply to instead we have a commitment to work together and use our joint resources to gain benefits for the local community. 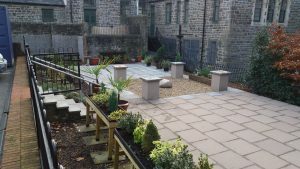 We were approached by Wellbeing Merthyr in the summer of 2018 to see if we could help with the landscaping of the Holocaust memorial garden which is a project that had been ongoing for some time. 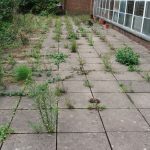 In August 2018 PHH environmental informed us that there was a school being demolished in Cardiff which had a large volume of industrial paving slabs which were due to be disposed of which we were able to have for free. With Albert & Flaherty very kindly offering their services in the form of a community benefit to assist with the garden we were all ready to upgrade the facility. 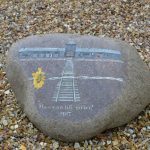 We hoped to complete the project in time for the Holocaust Memorial Day in January 2019 so in the space of a few short weeks over even shorter and colder days in November and December 2018 the garden was transformed into an oasis of solitude. 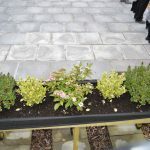 The focus of the garden is very much for remembering atrocities and genocide that have happened and unfortunately continue to happen all around the world. 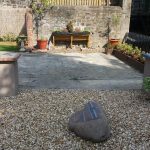 It is also a fantastic community space where people can gather either collectively or individually to read, chat or simply to enjoy a quiet space in the center of Merthyr. 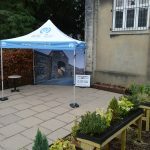 The garden is situated behind Merthyr Tydfil Central library and is accessed by walking between the library and Redhouse Cymru before turning right through the car park to the garden. During the summer months the array of flowers will make the place an even more special place with spaces to sit and enjoy the stunning surroundings. In order to keep the garden maintained budding horticulturalists are encouraged to get in touch and volunteer in the garden. 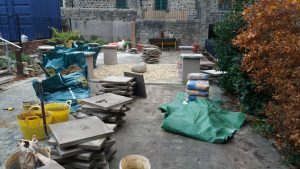 If you would like to volunteer to assist in the garden please pop into the library and speak to staff there who will be able to give you more information. We would like to thank the staff and board of Wellbeing Merthyr for working so closely with us on this project as well as the long list of other contributors to the project. We would like to give a special thank you to Albert and Flaherty for everything you did on this project, without your generosity and kindness there is no way we would have been able to create this wonderful community asset! Merthyr Tydfil Housing Association would like to encourage any community group who have an idea that they would like assistance with to get in touch to discuss their project to see if we are able to work together for the good of our community. Please contact lee Jones, Community Development manager on 01685352803.